IRS Form 6252 or the "Installment Sale Income" is a form issued by the U.S. Department of the Treasury - Internal Revenue Service. A PDF of the latest IRS Form 6252 can be downloaded below or found on the U.S. Department of the Treasury - Internal Revenue Service Forms and Publications website. Attach to your tax return. Use a separate form for each sale or other disposition of property on the installment method. Go to www.irs.gov/Form6252 for the latest information. Was the property sold to a related party (see instructions) after May 14, 1980? If “No,” skip line 4 .
complete Part III for the year of sale and the 2 years after the year of sale . Gross Profit and Contract Price. Complete this part for the year of sale only. property subject to (see instructions) . Subtract line 6 from line 5 . . Cost or other basis of property sold . Depreciation allowed or allowable . Adjusted basis. Subtract line 9 from line 8 . Income recapture from Form 4797, Part III (see instructions) . Add lines 10, 11, and 12 . Subtract line 13 from line 5. If zero or less, don’t complete the rest of this form (see instructions) . gain (see instructions). Otherwise, enter -0- . Gross profit. Subtract line 15 from line 14 . Subtract line 13 from line 6. If zero or less, enter -0- .
certain debts you must treat as a payment on installment obligations. If this is the year of sale, enter the amount from line 17. Otherwise, enter -0- . Payments received during year (see instructions). Don’t include interest, whether stated or unstated . interest, whether stated or unstated . Installment sale income. Multiply line 22 by line 19 . Enter the part of line 24 that is ordinary income under the recapture rules (see instructions) . Subtract line 25 from line 24. Enter here and on Schedule D or Form 4797 (see instructions) . Related Party Installment Sale Income. Don’t complete if you received the final payment this tax year. Did the related party resell or dispose of the property (“second disposition”) during this tax year? . If the answer to question 28 is “Yes,” complete lines 30 through 37 below unless one of the following conditions is met. Check the box that applies. The first disposition was a sale or exchange of stock to the issuing corporation. The second disposition was an involuntary conversion and the threat of conversion occurred after the first disposition. The second disposition occurred after the death of the original seller or buyer. dispositions. If this box is checked, attach an explanation (see instructions). Selling price of property sold by related party (see instructions) . Enter contract price from line 18 for year of first sale . Enter the smaller of line 30 or line 31 . Total payments received by the end of your 2017 tax year (see instructions) . Multiply line 34 by the gross profit percentage on line 19 for year of first sale . Enter the part of line 35 that is ordinary income under the recapture rules (see instructions) . Subtract line 36 from line 35. Enter here and on Schedule D or Form 4797 (see instructions) . For Paperwork Reduction Act Notice, see page 4. Revenue Code unless otherwise noted. payment from an installment sale. even if you didn’t receive a payment. 8949, or Schedule D, whichever applies. they were received in the year of sale. receive a payment from the sale. payment during the tax year. before the secured debt was obtained. for details on unstated interest. received during the year of sale. • Timeshares and residential lots. your tax return, excluding extensions. listed on line 29 are met. with respect to the property. • Section 179 or 280F. bank, the seller, or other sources. • Alternative motor vehicle credit. year is more than $5 million. • Qualified plug-in electric vehicle credit. • Qualified electric vehicle credit. • Nonbusiness energy property credit. • Personal property before 1989.
lots under the installment method. • Energy efficient home credit. 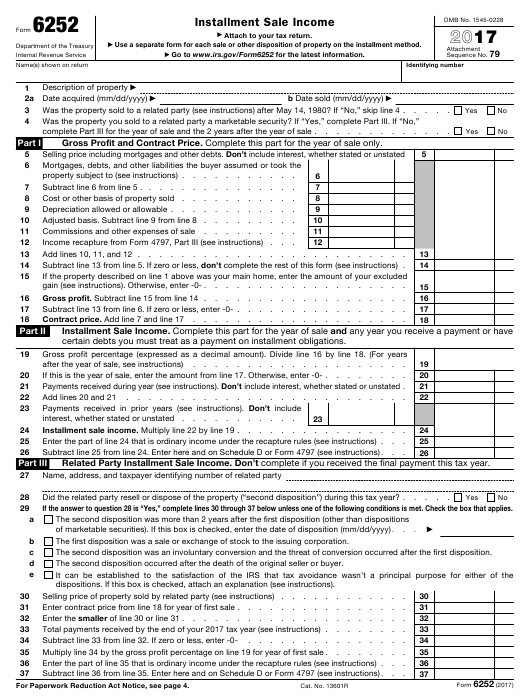 amount, complete Form 4797, Part III. for details on how to report the interest. for this property on line 32 of Form 4797. • Enhanced oil recovery credit. the Instructions for Form 4797. For additional information, see Pub. D for your tax return. exclude part or all of your gain. See Pub. taken with respect to the property. 523, Selling Your Home, for details. interest, or original issue discount. you didn’t file Form 6252 for that year. debt or to pay broker and legal fees. interest, whether stated or unstated. See the instructions for line 26.
the right amount of tax. deemed payments from prior years. • The pledge rule of section 453A(d). resale are being collected sooner). who file this form is shown below.
. 1 hr., 18 min. sold before June 7, 1984.
return with which this form is filed. IRS Form 1065 2017 Schedule K-1 - Partner's Share of Income, Deductions, Credits, Etc.